Hundreds of Chicagoans hopped a bus early Monday to join protesters in Washington, D.C., and "take back the Capitol" from what they call the wealthiest 1 percent. The group left Chicago around 5:30 a.m. headed for the National Mall, where they say their first order of business is to occupy the area and build a "people's camp." On Tuesday they'll visit congressional offices and lobby to extend federal unemployment benefits. On Wednesday they plan to march on K Street in protest of corporate lobbyists, and on Thursday they'll have a prayer vigil for the unemployed. "I'm hoping that somebody will listen," said Andy Gebel. "Until politicians start feeling that their jobs are in jeopardy they're not going to worry about other people's jobs or lack of jobs." At least 24 organizations from 14 states plan to participate, including 300 from Stand Up! 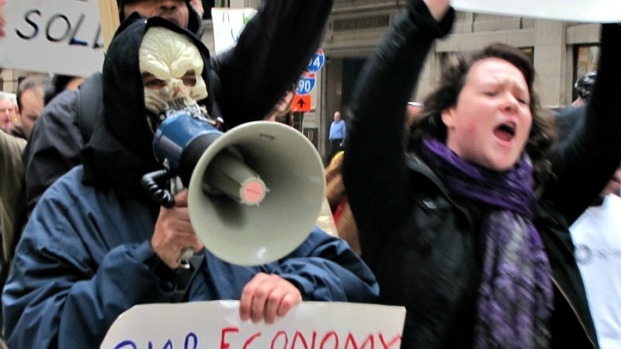 Chicago, Occupy Chicago, SEIU local 1 and the Illinois Hunger Coalition. Organizers said as many as 3,000 unemployed workers from across the country plan to attend the four-day protest. "We need that money back here, we need it in our communities," said Michelle Torres. "There are so many hungry people now, so many homeless people now, and it has to stop, it has to end. That's why we're out there." Protesters say Congress cares more about the wealthiest 1 percent than about the struggling middle class. "People across the country are starting to get the message that if we continue to allow special interests to run things instead of the public good then the country will continue to be broke and the economy will continue to be terrible, people won't have jobs," said protester Patrick Robinson.